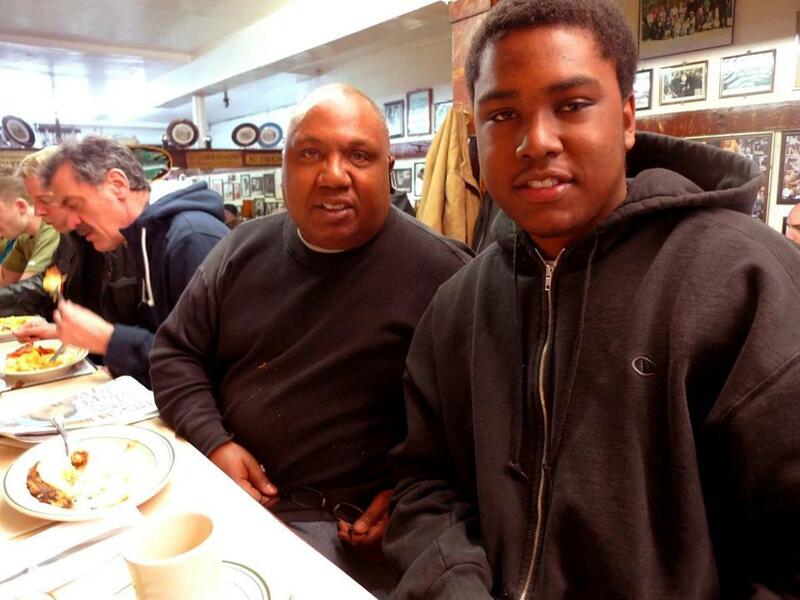 Father and son bring 45 years of appreciation to Charlie’s for its turkey hash and more. Third in a series on the James Beard Foundation America’s Classics in New England. There used to be a pizza and sandwich joint in our neighborhood called “Friendly Eating Place,’’ where successive waves of young Greek immigrants worked the grill. It’s gone now, but the name of the place could easily apply to either of the pair of Boston eateries designated as America’s Classics by the James Beard Foundation. Yet in other ways, these two are as different as night and day. Or maybe as breakfast and dinner. Boston’s quintessential Yankee dining room, Durgin-Park, made the list when the America’s Classics category was launched in 1998. The Beardies didn’t catch up with Charlie’s Sandwich Shoppe until 2005. Durgin-Park was famously “established before you were born’’ in the 1820s to feed the workers at Quincy Market when the district was more a market rather than a tourist destination. 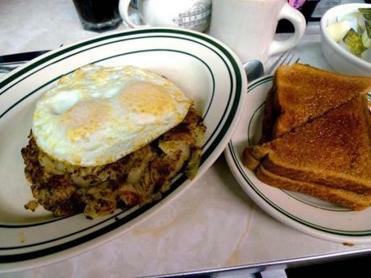 Breakfast is the mainstay at Charlie’s, which has been a South End fixture since 1927. The line was surprisingly short when we arrived at Charlie’s around 8 a.m. one recent Saturday. Waiting for seats were Clyde Nesbitt and Clyde Nesbitt III. “I’ve been coming here for 30 years,’’ said the senior Clyde. Pointing to his strapping son, he added, “He’s been coming here since he was 4.’’ (That’s only 15 years.) The older Nesbitt always orders the turkey hash, two eggs medium, and wheat toast. Charlie’s is famous for its turkey hash - lighter than the corned beef variety, with less salt and fat. The Nesbitts took two stools at the counter, and we were waved to a couple of bentwood chairs at a communal table. Part of what makes Charlie’s such a friendly place is that you always have company when you eat. During the time it took us to order and eat blueberry pancakes and a hash-and-eggs combo, we made several acquaintances. Walter and Amy Schaeffler from Brookline had brought their children Johnny, 5, and Ella, 7, for every kid’s preferred breakfast of chocolate chip pancakes. “We love our breakfast places,’’ said Walter, as he and Amy began reeling off other favorite spots from their days living in Vermont. Routine is the name of the game at Charlie’s. “People are here every day; they sit at the same table,’’ said waitress Marie Fuller, one of the four children of Christi Manjourides who operate Charlie’s. “Our dad was 17 when he came to work here in 1927, the year it opened,’’ she said. “For the first 30 years, Charlie’s was open 24 hours a day, seven days a week. My dad worked 12-hour days and Charlie worked 12-hour nights. They never locked the door.’’ And in 1946, Manjourides bought half-ownership from Charlie Poulos for $1,000. It’s been a family business ever since. Later that day, we climbed the stairs at Durgin-Park in Faneuil Hall Marketplace, which probably pioneered the communal dining table in Boston. A hostess led us to a long table where she set down menus on facing sides somewhere in the middle. Moments later, a checked tablecloth was fluffed on top of the old one and a couple of big cloth napkins came sailing through the air, followed by some silverware that our waitress dropped in a drive-by moment. As it worked out, we were flanked on one side by Northeastern sophomore Abigail Dusseldorp and her parents and brother, who were visiting from New York. On the other side were Jennifer and Mark Slauson, and their daughter, Sonia, 2. We initially took Mark for a local, or at least a New Englander, since he was wearing a Red Sox cap. Actually, the Slausons live in Germantown, N.Y., and he has been a Sox fan since age 5, growing up in the Hudson River Valley. Mark wears the cap all the time and even gets to Boston occasionally for Red Sox games. But it was his first time at Durgin-Park. He and Jennifer had made the choice on the recommendation of a friend, “and on the notoriety of the place,’’ he said. It’s not surprising that the patrons at Durgin-Park don’t come from the neighborhood the way they do at Charlie’s, as there is not much of a residential neighborhood left near Faneuil Hall. Besides, local diners are more inclined to seek out farm-to-table bistros than specialists in the time-honored standbys of roast prime rib, Yankee pot roast, baked scrod, homemade Boston baked beans, and baked Indian pudding. Not since they swept the sawdust off the floors, we bet. Like Charlie’s, it’s a pretty friendly eating place. Mon-Fri 6 a.m.-2:30 p.m., Sat 7:30-1. Breakfast $6-$13, lunch $4-$11. Cash only. Patricia Harris and David Lyon can be reached at harris.lyon@ verizon.net.